Painting laminate furniture like this bookcase can quickly update and refresh your furniture this spring! How many mommies have a “junk” corner in their house? I can admit that I am guilty of being one of those mommies. As a native New Yorker who lived in apartments her whole life, I never had to wield a hammer, drill (or any other tool for any DIY projects) so that junk corner just kept getting bigger and bigger. My particular corner of shame was a laminate bookshelf that held shoes for 4 adults and a baby. As Muslims, we prefer not to walk around our homes wearing our shoes since we pray on our floors. However, this meant I had a HUGE eyesore of a bookshelf with all of these shoes in it! After harassing the Hubster to head to Ikea to buy a concealed shoe rack, we finally tidied up our “junk corner.” However, now I was left with this laminate bookshelf! I didn’t want to throw it out, but it did not look good with our bedroom decor (which is where we had to move it for space reasons). Luckily, I have been making plans to expand Hijabi Life to include simple Do It Yourself (DIY) projects around the home to help make your life more beautiful. So I thought to myself, “Why not start with this laminated bookshelf DIY?” It literally only took me 2 days to complete (and only because I need the paint to dry). You can do it indoors in a smaller space like a condo as well. As you can tell from my “after” picture, the results are well worth the effort. I got more space to put up my book collection, the shoe storage issue was solved, and I was one happy mama. 1) A primer for painting laminate furniture. I preferred Zinsser primer because it dries fast and gives a good finish. 6) A small can of paint (Just note, you can use 3 small trial cans of paint to paint a shelf and it costs like $6 if you are a bargain type of hijabi like me). I would recommend using a light flat paint color so the shelf looks more shabby chic, but you can do darker glossy colors if you wish. 1) Lay tarp on the floor. 2) Move shelf on tarp. Remove the shelves for easier access. You will be painting the shelves later any way. 3) Prime entire case and shelves. 4) Let the bookcase dry overnight. 5) Start painting! I even had my babykins help me paint when I got my first coat of paint on the shelf. She had SO MUCH fun. If you would prefer NOT to have the kids help, do this when they are asleep. 6) Make sure to paint the shelves too! 7) When its completely dry, add wallpaper to back of the bookcase. 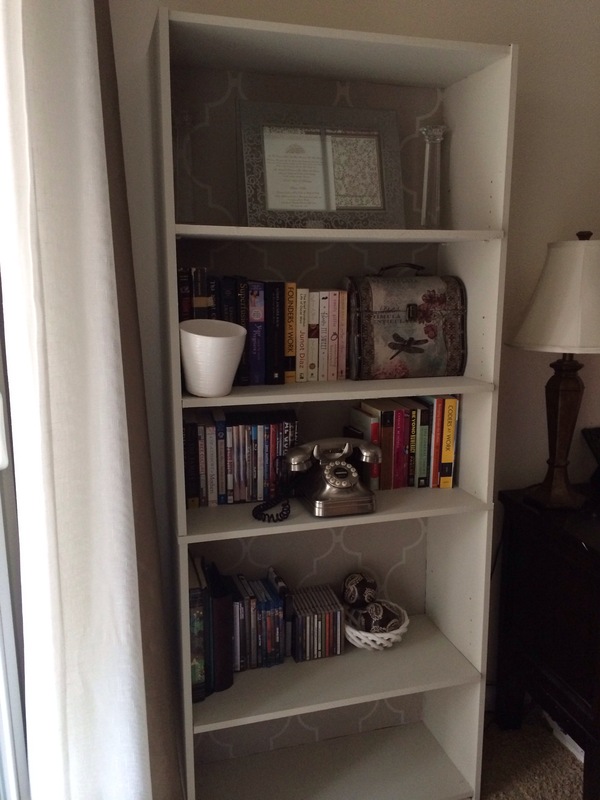 8) Add shelves back on and add your books, toys, decorative items, or anything else you would like to store! Did you like the DIY Hijabi post? Let me know and I will add more easy ways to make your home beautiful inshallah!